These cormorants may have lost the ability to fly but they have more than made up for this with their underwater abilities. The Galapagos flightless cormorant is an endemic species to Galapagos and is not only the heaviest cormorant species, but also the one which cannot fly out of 29 species. As the name suggests, they cannot fly away and are therefore confined to the lava shoreline and beaches of Isabela and Fernandina. The adults are black on top and dark brown underneath with bright turquoise eyes. They have stunted wings that are one third the size of the wingspan they would require to fly. They have four webbed toes (like all members of the cormorant family) and the females tend to be smaller than the males. Natural selection led to the species no longer having functional wings as they had very few land predators, and individuals that were better suited to swimming were more successful in passing on their genes. 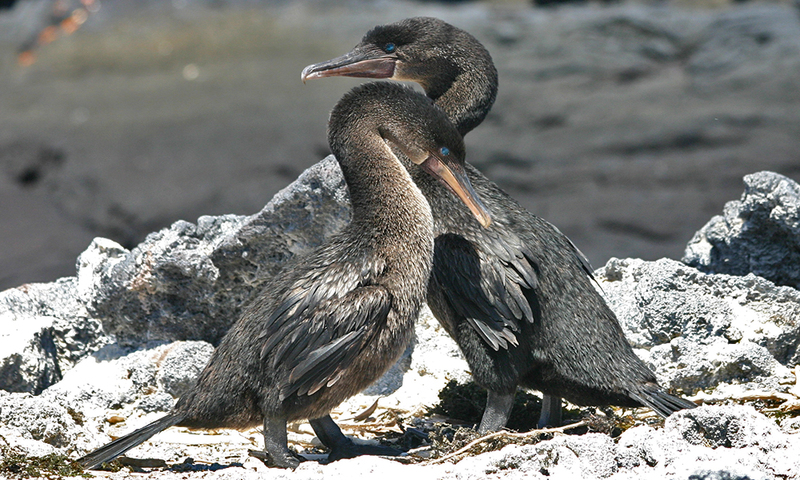 Currently there are around 1,000 breeding pairs of flightless cormorants on Isabela and Fernandina. Although their wings are stunted, they are used for balance when the cormorant jumps from rock to rock along the coast. As their wings don’t produce very much oil, they have lost some of their waterproofing so after a dive they can be seen to hold their wings out in order for them to dry. Their diet consists mainly of eels and octopus, which they reach by diving deep to the ocean floor. Unlike penguins, they do not ‘fly’ underwater, but tuck in their wings and kick with their powerful hind legs, using their flexible necks to spear octopus and fish from inside small refuges in the reefs and rocks. On the surface they sit very low in the water, with only their necks visible from a distance. Couples perform a strange and unique courtship dance that involves them intertwining their necks whilst twirling in a tight circle. The mated pair then makes a nest a few metres from the sea out of seaweed, flotsam and jetsam. Most eggs are laid between May and October, which are the coldest months, resulting in an abundance of marine food and less heat stress on the hatchlings. The eggs are incubated for 35 days until they hatch, after which the parents take turns to feed the chicks. Eventually the male is left to care for the chick and the female starts a new breeding cycle, which can happen up to three times in one season. When the chicks become adults, they develop the trademark blue eyes. Where to see them: They are mainly found on the north western coasts of Isabela and the east coast of Fernandina. When to see them: They can be seen all year round. Nesting occurs between May and October. Threats: They have few predators. On land, snakes, owls and hawks are potential predators, along with introduced mammals such as cats and rats. In the sea they may be preyed upon by sharks. Fishing poses a big threat because it not only decreases the cormorants’ food supply but also puts them at risk of getting caught up in fishing gear. Due to its small and concentrated population, this species is particularly vulnerable to any changes in environment such as El Niño. In 1983, half the population was lost during a severe El Niño event. Nest flooding and volcanic eruptions decrease the population as well as local illegal fishing, and oil spills could have a huge impact if the spill were to reach the seas around Isabela and Fernandina. They are also likely to be at threat from marine plastic pollution, both through ingesting it and through being entangled by it. Conservation Action: Recently the population has stabilised due to conservation actions. Invasive species have been controlled around nesting sites resulting in the population increasing. GCT has previously funded a project that monitors populations of flightless cormorants, as well as Galapagos penguins and waved albatrosses. 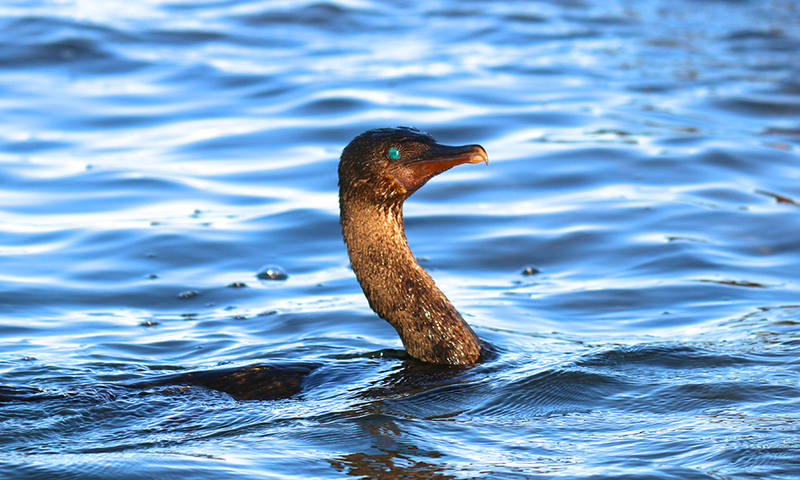 Currently, we are working with partners to assess the risk of marine plastic pollution to flightless cormorants as part of our Plastic Pollution Free Galapagos programme. 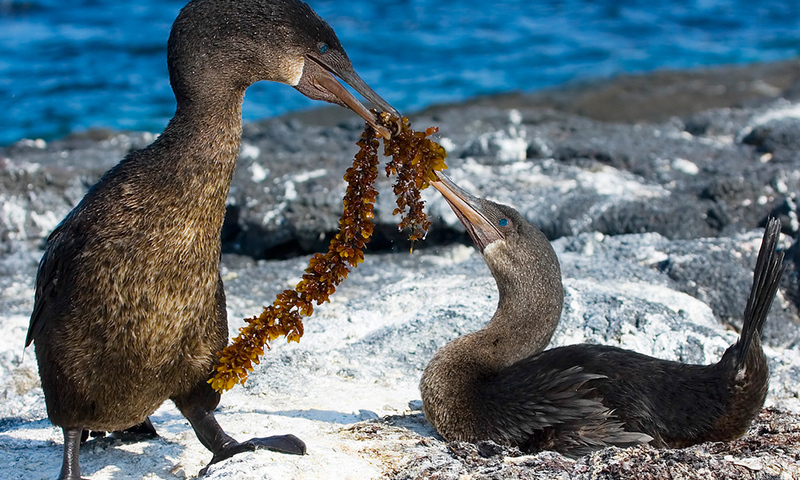 Help us to protect flightless cormorants today by donating to our Plastic Pollution Free Galapagos programme! Flightless Cormorant from Rebecca Yale on Vimeo. Galapagos penguins and flightless cormorants act as indicator species for the ecosystem as a whole. By monitoring their populations researchers can discover the bigger picture.